We wanted to create a healthy Fish Cake Recipe that would make you think of the Mediterranean as soon as you bite into it and to do that we have had to go back to the beginning and start all over again. We've incorporated all the great Mediterranean flavours in them... fish - garlic - olive oil - lemon juice - wine - red peppers - chillies - fresh herbs - the list goes on and on. 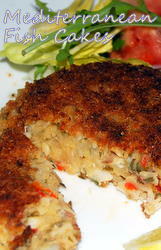 Do give it a try as we love these fish cakes and are really proud of them. Why not incorporate them into your own Mediterranean Diet. 50g./2ozs. Fresh bread crumbs - dried out. Okay - cut the potato into 1" cubes and boil in salted water until tender. Drain in a collander until quite dry and then mash with a fork. Add the roasted red pepper to the potato and mix it well in a bowl. Now - fry the onion in the olive oil until soft adding the garlic towards the end. Right - add the fish - wine - chillies - paprika, half the lemon juice and the zest and herbs and cook over a low heat until the fish is flaking and almost all the liquid has boiled away. Let it cool and mix in with your potatoes and red peppers. Form into patties - around 3" x 3/4" or if you want to make Tapas shape the mixture into 1" balls. Cover your patties with the egg and roll them in the crumbs. Put about 1/4" of olive oil into large non stick fry pan and fry the fish cakes until golden on both sides and drain on kitchen paper if required. Serve with our tasty tomato salsa and squeeze over the remaining lemon juice.